The foundational ideals of American governance are limited government and individual freedom — two notions that conflict with Harris' worldview. 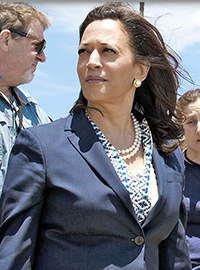 In addition to pushing a "Medicare for all" policy — now widely supported by presidential hopefuls — Harris says that private insurance (already governed by a massive regulatory regime) should be banned outright in favor of a government-run program. "Let's eliminate all of that. Let's move on," she told CNN's Jake Tapper. It is one thing that Harris supports the Green New Deal, which would artificially make our cheapest and most ubiquitous energy sources prohibitively expensive. The Green New Deal's requirement that the U.S. eliminate nearly 90 percent of our energy sources would be a suicidal policy initiative. But the plan's insistence that some Americans must replace "non-essential individual means of transport with high-quality and modern mass transit" sounds pretty authoritarian. Not a "literally Hitler!" level of authoritarian, no. But still, having some technocrat decide which Americans have to give up their "non-essential individual means of transport" so they can use a (oxymoronic) "high-quality and modern mass transit" system feels like an unreasonable attack on personal freedom. Harris claims that these intrusions mean rediscovering American values. The foundational ideals of American governance are limited government and individual freedom — two notions that conflict with Harris' worldview. Genuine liberalism within the Democratic Party died during the Obama administration. Since then, a number of Democrats have tried to recast their soft authoritarianism as a patriotic endeavor. I apologize for the cliche, but it's quite Orwellian.